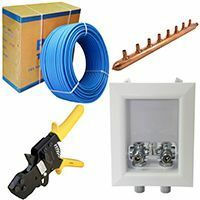 PexUniverse.com is a leading source for PEX plumbing and radiant heating supplies with a full line of products for installation and maintenance of PEX systems. Our large inventory includes lead-free PEX products which comply with SDWA (Safe Drinking Water Act). We carry all items in stock and offer fast nationwide shipping. PEX heating supplies for radiant floor heating, snow melting and hydronic heating applications. Lead-free compliant PEX supplies for hot and cold water residential and commercial applications. We stock a complete selection of Oxygen Barrier, Non-Barrier and PEX-AL-PEX tubing for plumbing and heating applications. 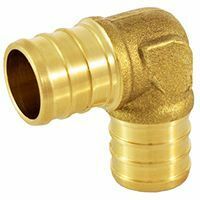 PEX crimp, push-fit, expansion and compression fittings in regular and lead-free brass in all types and sizes - elbows, tees, couplings and others. 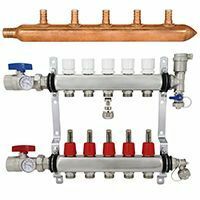 PEX copper & poly manifolds for plumbing and stainless steel or brass radiant heat manifolds for radiant heating applications. 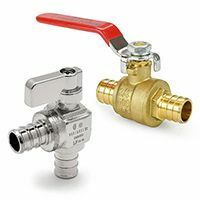 Crimp, push-fit and expansion style PEX ball valves and stop valves in all types in sizes for use in heating and plumbing applications. 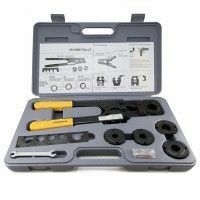 PEX Crimp Tools, Clamp (Cinch) Tools, Pipe Cutters and other tools for installating PEX pipe and making PEX connections. The term PEX or PEX tubing refers to crosslinked polyethylene tubing, manufactured by extrusion process. PEX was originally produced in Europe over half a century ago, later introduced in USA and has proven to be a reliable and cost effective alternative to copper pipes. PEX is available in non-barrier and oxygen barrier types. The former features an additional external oxygen diffusion layer which prevents diffusion of oxygen molecules into the water through the pipe walls. 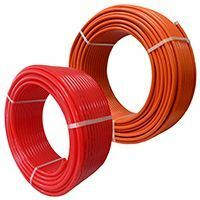 Non-barrier PEX is typically used for hot and cold water plumbing applications, whereas PEX with oxygen barrier is used for heating. Presently, PEX tubing is manufactured in 3 types: PEX-a (Engel or peroxide production method), PEX-b (Silane or moisture cure method) and PEX-c (Irradiation or electronic beam method). The main difference between these is the method used to cross-link the polymer molecules. Contrary to the common belief, these do not indicated the “grade” or quality of PEX tubing. Silane method is the most common today mainly due to high quality of the end product and low manufacturing costs. Engel method is still used by a few manufacturers, but is an older and a slower manufacturing method, resulting in higher end product costs. PEX produced by Irradiation method is the least common, since it has the lowest cross-link percentage and is not considered to be a “true” PEX by many professionals in the industy. PEX and PEX products have a wide range of uses and are generally designed for hot and cold water applications which do not exceed 180°F. Hydronic & radiant heating is one of the most common areas of application where PEX is used. 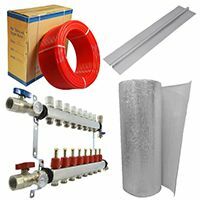 Among the most widely used PEX supplies for radiant heat are the oxygen barrier PEX, radiant heat manifolds and heat transfer plates. PEX in conjunction with the manifold system is used to distribute the hot water to the areas where heat is desired. Aluminum heat transfer plates are often used to enhance the performance of the heating system, in nearly all cases, in combination with insulation. Hot and cold water plumbing is another very common use of PEX and offers countless advantages over the traditional rigid piping systems – from lower costs and higher resistance to pipe bursting, to better flexibility, less installation time and much more. PEX products used for plumbing mainly include the non-barrier PEX pipe, manifolds, tools and fittings. PEX manifolds, together with tubing, allow to run individual PEX lines to desired locations, often reducing installation costs and minimizing number of connections. PEX fittings are used together with tools to make connections. Installation accessories such as pipe clamps, tube talons and bend supports are often used for pipe support and routing purposes.